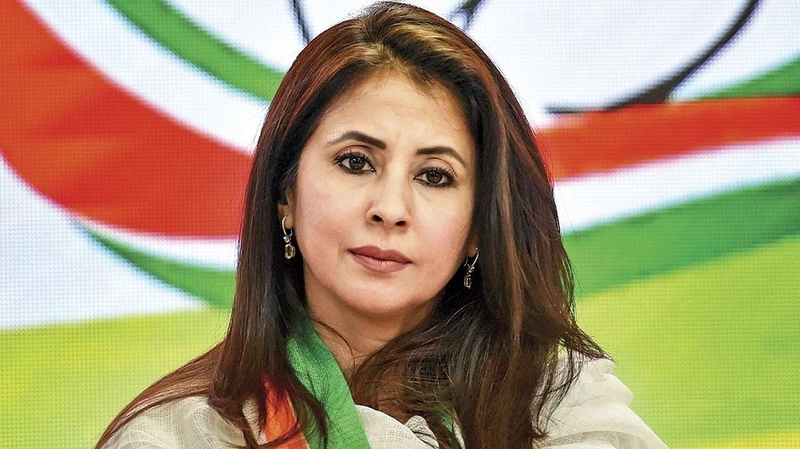 HOURS after she was nominated the Congress candidate for Mumbai North Lok Sabha seat, Bollywood actress Urmila Matondkar was targeted by trolls on Saturday. On her Wikipedia profile page, some miscreants changed her name, religion and other details, sparking a furore among her family and supporters this afternoon. For starters, she was rechristened ‘Mariyam Akhtar Mir’, who was married to a Kashmiri businessman and model Mohsin Akhtar Mir in 2015. Point No. 8 in her changed profile proclaimed: “After her ‘nikaah’ (Muslim marriage ceremony before a cleric), she has changed her name legally’ to Mariyam Akhtar Mir”. It went even further citing her parents as Shivinder Singh and Rukshana Sultana, implying she was a second generation in the family to have an inter-religious Hindu-Muslim wedding. “This is sheer nonsense perpetrated by some mischievous anti-social elements. Wikipedia should take action against them,” said her shocked father Shrikant Matondkar. “For Urmila, this is purely an ideological fight for upholding democratic ideals and her strong convictions. She would never stoop so low as to discuss the family or relatives of her opponents on such platforms,” said her father. Maharashtra Congress spokesperson Sachin Sawant said that “this effectively proves that the BJP considers her a ‘serious contender’ and not a lightweight as some of their leaders have been claiming”. Sawant had posted almost a prophetic tweet on Friday after Urmila’s candidature was announced: “The moment the Congress declared her candidature, the BJP got so terrified of imminent defeat that their Dirty Tricks Department has started raising her marriage in social media. Should we remind dirty minds of BJP about the marriage of Dharmendraji (with) Hemaji?” Unfazed by the trolls, Urmila is busy campaigning in the constituency which sprawls through the thickly populated suburbs of Malad-Kandivali-Borivali-Dahisar, in north-west part of Mumbai. “In just two days, we have witnessed record crowds turning up to meet and greet her. Our candidate is getting similar or even better response than Govinda (2004). We are besieged with requests from all localities where people clamour for a ‘darshan’ of Urmila even before she files her nomination papers,” said Mumbai North District Congress President Ashok Sutrale. Referring to the trolling, he pointed out that Urmila is getting a warm, spontaneous and enthusiastic welcome from people belonging to all castes, communities, speaking different languages and hailing from different economic strata of society. “This is not surprising. She is the first and probably the only woman candidate anywhere who’s a beauty with brains, making her a very formidable challenger to her political opponents,” said global media consultant Charu Satam. He said “the vicious comments” against her, coming barely hours after her name was announced is an indicator that the nefarious troll army of the BJP is unnerved by her very presence in the electoral fray. Following intervention of some people, the original Wikipedia page was restored with the necessary corrections.